July 14, 2017 - Eugene Oregon. 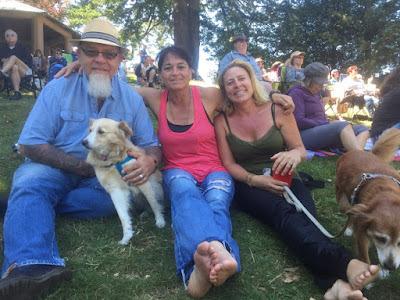 My last report was nearly a week ago from Brookings Oregon, just after performing the Saturday Market for Chetco Brewing. Since then, we have been moving and staying busy. I've not had the time to sit and write. I don't expect today will be much different, but I am going to start making the time. This has been a week of meeting old friends, making new friends and washing clothes on the fringe in Eugene Oregon. The older I get, the worse my memory gets. This road diary, or Road Report as we call it, is our way to remember the people and places. Sometimes the timelines in our lives can get mixed up, crossed or forget altogether. We hope to be able to document each day in an effort to keep the story straight. On July 9, we played the beautiful Brookings Harbor, which was really fun, and we met some really great folks. The sound guy Mark turned out to be a real connector of people and in the short time we were with him, he was non-stop helpful in any way he could, including inviting us to a free Beatles Tribute concert in the park the next day, and we accepted. July 10 - The Azalea Park in Brookings has a beautiful amphitheatre with enormous stage and grassy hill lined with trees for the audience. It appeared as if it held 800-1500 people and today the place was packed. There was even a car show with a 64' Ford Galaxy 500, the first car I ever owned, ever so briefly. It also turned out to be the first car I ever lost too, thanks to my mom. I guess when she said, "be good or you'll lose it", she meant it. Sweet and I had a great view for enjoying some Beatles favorites, and looking about the crowd. I noticed someone down in the crowd that looked like our old friend and boxing trainer Jenifer Alcorn from when we lived in Fresno. We had not seen Jenifer in 15 years. Sweet went down to take a closer look. Sure enough it was Jenifer. Then from under a huge umbrella emerges Brad, her husband. an enormous man towering over everyone and former Fresno Police SWAT. Brad was working with us in charge of security at events we produced back in the day. That night we went to their new home they'd recently moved to from Fresno. Jenifer retired as WORLD CHAMPION female boxer and Brad retired from the police force. It was a great night of conversation and storytelling. That night we stayed in the parking lot of a church across the street. July 11 - We figured we had a couple of days before we had to perform again, so we decided to just find a place to park, get some work done and relax. We searched many of our favorite boondocking sites and thought we found a great park in Cottage Grove outside of Eugene for only $10 per night. When we got there, it was a beautifully maintained campgrounds with full services, but there was no Internet or cell service. So, it wouldn't work for us. We noticed a Walmart on the way to the park and decided to go back there. Turned out to be the busiest Walmart we'd ever stayed at, there were semi trucks, campers, RVs, a pair of matching million dollar Prevost rock star busses, and several folks living in their cars. The next morning we got the last of any needed supplies and we were out of there. We instead found one of our favorite boondocking locations at the Valley River Center in Eugene. As it turns out, you can stay in their parking lot in the back row for free for up to 2 days. Security came by and checked us in and gave a 2 day stay pass for our window. You're only allows 2 days stay per 6 months. The parking was under giants shade trees, away from cars and traffic, alongside the river with a bike and walking path that went miles in both directions. We parked, practiced music, took the dogs on long walks and caught our breath. July 12 - Today we found a dog park to let the dogs run, a large self service car wash that we could wash and polish the RV. We also ran an ad on Craigslist the day we arrived and were able to sell an old Fostex MR-8 digital recorder we never use but have carried around for years. We also found a laundromat we thought we could do some clothes and get on wifi to get more work done. We did get some clothes done, but no wifi. However the small little laundromat was the wildest laundry day to date. There was an entire family of homeless doing their laundry, about 4 grown adults (the kids) and their mom. It was something new to us. Come to think of it, I didn't see any clean clothes, so I think they were washing a blanket, maybe. Anyway, they were colorful and interesting and there were several others as well, but then the oddest of them all walked into the scene. The first thing I noticed was a skirt and combat boots from the back. I also quickly noticed there was no shirt, only long hair over the shoulders and bare back. As they turned I noticed breasts, full sized c cup breasts, but as they continued to turn in my direction I was taken back by the full beard and young mans face. The guy, gal, person was pushing another odd character in a wheelchair. Sweet and I just sat inside browsing a magazine collection of Anarchist mags published a decade past. We finally got the single load washed and dried and as were leaving one of the "grown children" of the family gets into it verbally a little with the bearded lady, so I see the bearded lady push the wheelchair down the sidewalk talking angrily to the person in the chair and the child comes walking past us as we leave "did you see the hooter on him?". I just replied, "ahhh, yah?!" and we kept walking. July 13 - Our two day time limit had expired, so today we got a few things done in the morning. Then made our way to Jimmy Mac's Overtime Grill to see a jam being put together by Dave Roberts, the drummer that will be playing with us the next day at Argarian Ales. We thought it would be good to get to know him early and maybe even jam a little. Turns out, we didn't get to play with him, but we did do a 4 song set with some other great musicians. Sweet and I really enjoyed ourselves, as did the other players behind us, from what I could tell. And although the crowd, made up primarily of musicians seemed to enjoy our show too. I always feel we don't fit in. Either we're too hard to be real blues, or too bluesy to be rock. Sweet always says, "just do your thing, don't worry about what they think", but I can't seem to do that yet. I hope to get there. We ended up staying until the place closed and had a nice conversation with some very nice regulars at Overtime, and really thought it was a cool place. The owner Chris was terrific. We thought she was terrific when we assumed she was the waitress, but then Dave the drummer introduced us to the owner - and she was one in the same. She even let us spend the night in the parking lot under 24 hour security. Yah baby. July 14 - This morning we woke way too early. Found a dog park a few miles away to let the girls run free. Sweet took the girls while I take the time to get our road diary up-to-date. This afternoon at 4PM we are playing at Agrarian Ales. This is going to be outdoors, on a large farm that grows hops and brews ales. Should be a lot of fun. We know there will be other musicians joining us. Looking forward to it. We'll let you know how it goes in the next Road Report.